last December, we’ve added content from MySpace, Facebook and Buzz, expanded to 40 languages and added a top links feature to help you find the most relevant content shared on updates services like Twitter. Today, we’re introducing a new feature to help you search and explore the public archive of tweets. With the advent of blogs and micro-blogs, there’s a constant online conversation about breaking news, people and places — some famous and some local. Tweets and other short-form updates create a history of commentary that can provide valuable insights into what’s happened and how people have reacted. We want to give you a way to search across this information and make it useful. The chart shows the relative volume of activity on Twitter about the topic. As you can see, there are daily spikes in the afternoon (when parks are the most fun) and an unusually high spike on March 27. 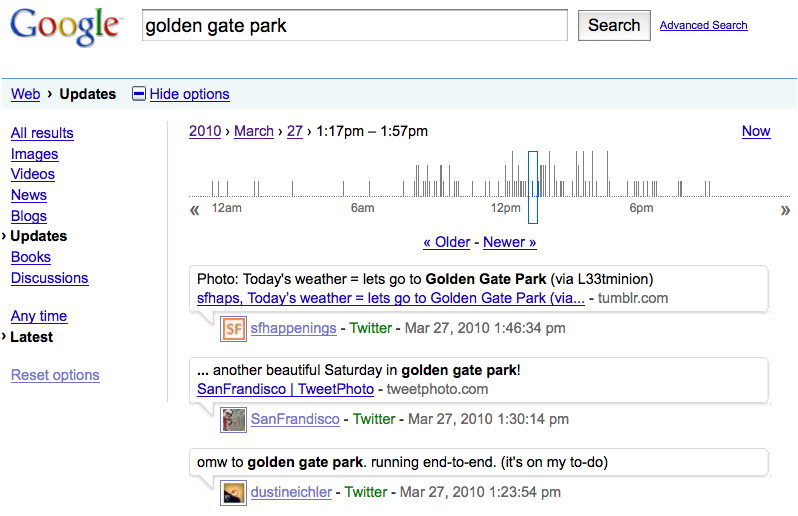 Clicking on the 27th, you’ll discover it was a sunny Saturday, which may explain the increased traffic on Twitter. People were tweeting about disc golf and tennis, biking, riding a party bus, craving chips and salsa...the kind of local, time-specific information that up until now would be almost impossible to find online. By replaying tweets, you can explore any topic that people have discussed on Twitter. Want to know how the news broke about health care legislation in Congress, what people were saying about Justice Paul Stevens’ retirement or what people were tweeting during your own marathon run? These are the kinds of things you can explore with the new updates mode. The replay feature is rolling out now and will be available globally in English within the next couple days (if you want to try it now, try out this special link). 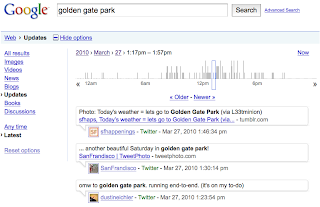 For our initial release, you can explore tweets going back to February 11, 2010, and soon you’ll be able to go back as far as the very first tweet on March 21, 2006. All of us are just beginning to understand the many ways real-time information and short-form web content will be useful in the future, and we think being able to make use of historical information is an important part of that. As for me, after some hard work on real-time search, it’s time for a virtual vacation to relive one of my favorite moments of the Winter Games. 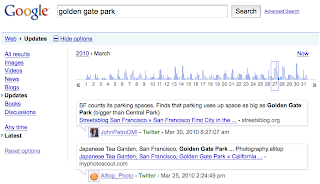 Since we first introduced real-time search last December, we’ve added content from MySpace, Facebook and Buzz, expanded to 40 languages and added a top links feature to help you find the most relevant content shared on updates services like Twitter. 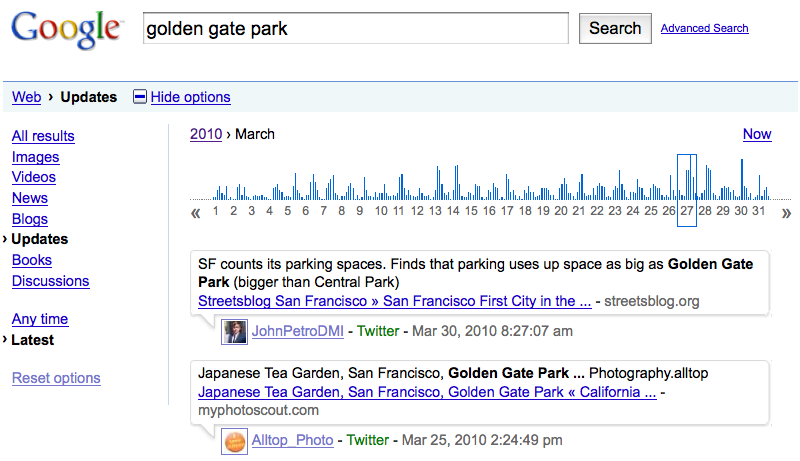 Today, we’re introducing a new feature to help you search and explore the public archive of tweets.